To the observers of the unfolding Greek debt-crisis drama, the actions of Mr. Alexis Tsipras, the Prime Minister, must have been particularly confounding. When offered a bail out deal by the finance ministers of the remaining Eurozone countries on 27th June, days before Greece had major payment due to the International Monetary Fund (IMF) and no other means to make the payment, Mr. Tsipras balked and asked for a national referendum on the issue. Stung by the news, the finance ministers unilaterally withdrew the deal. Greece anyway voted against the non-existent deal on 05th July by an overwhelming margin of 61-39 and Mr. Tsipras himself campaigned against the deal. But, within a week, he made a volte-face and in a Eurozone summit held on 12th July, he accepted a bailout package that is, by all accounts, far more severe on Greece than the previous package. And in the meantime, he led his country through more than two weeks of capital controls, bank closures, breakdown of normal economic activities and banks tottering on the brink of collapse. The whole scenario, however, starts making more sense once it is viewed as a decision tree in the mind of Tsipras. Standing on 27th June, with a not very palatable deal in front of him, Tsipras would have thought about the future and the choices he had. Well, one choice was obviously to accept the deal which may be considered a base line scenario for him (i.e. one with utility of nil). Here, he does not agree with the deal completely but the deal is reasonable enough to be a face saver for him and he avoids a Greek exit from Euro. However, if he goes for the referendum, he may end up with a better deal (say with utility of +1), the same deal, a worse deal (utility of -0.5) or if everything else fails, Greek exit from the Euro (utility of -1). 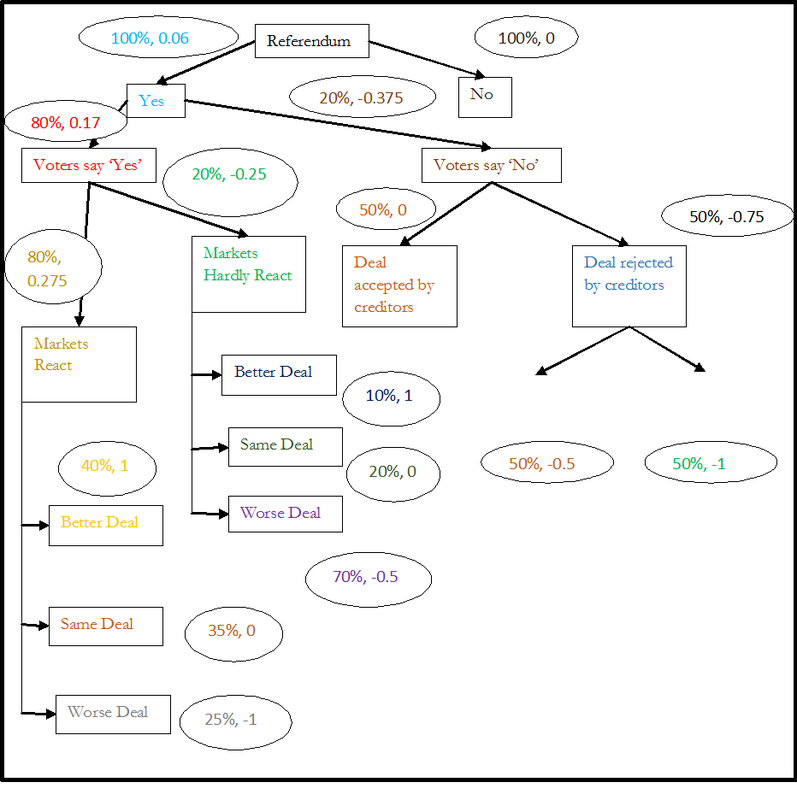 Here is a decision tree of how the choices may have played out in his mind. 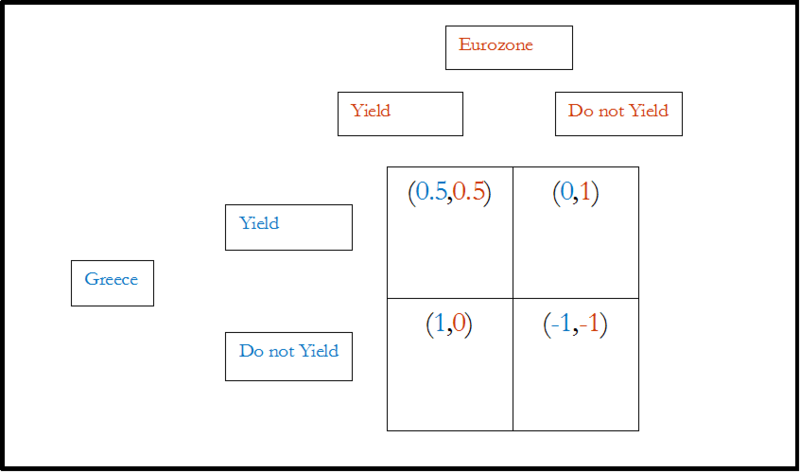 The various boxes represent the different outcomes possible while the circular (or oval shaped) boxes show the probability of each outcome and pay-off from the outcome mentioned in the adjacent box. The utility and probability numbers are obviously not exact ones as we can only hazard guesses about what led Tsipras to take the decision. However, since Tsipras in real life went with the referendum, the utility of that decision must have been more than zero (in our hypothetical scenario, the utility was 0.06). This in turn helps us place the probabilities that he must have assigned in his mind to various scenarios while arriving at the decision. i) Tsipras is not exactly rational. ii) Tsipras is a risk seeking decision maker, quite unlike most of you and me, who are risk-averse people. In other words, for taking unnecessary risks, we demand an expected utility which is higher than the utility in the risk-free scenario. However, for a risk seeking decision maker, it may be the reverse. He may demand lesser utility for taking more risks. iii) Tsipras is an optimist who vastly overrated the probabilities of the various favourable scenarios in his mind. For the Eurozone finance ministers who were stunned by the call for referendum, the decision to withdraw the deal was a swift one. The logic was simple – by keeping the deal on table, they would lend an air of legitimacy to the referendum, and hence if the deal gets rejected by the Greek voters, they would place themselves under pressure to accept a deal more favourable to Greece. 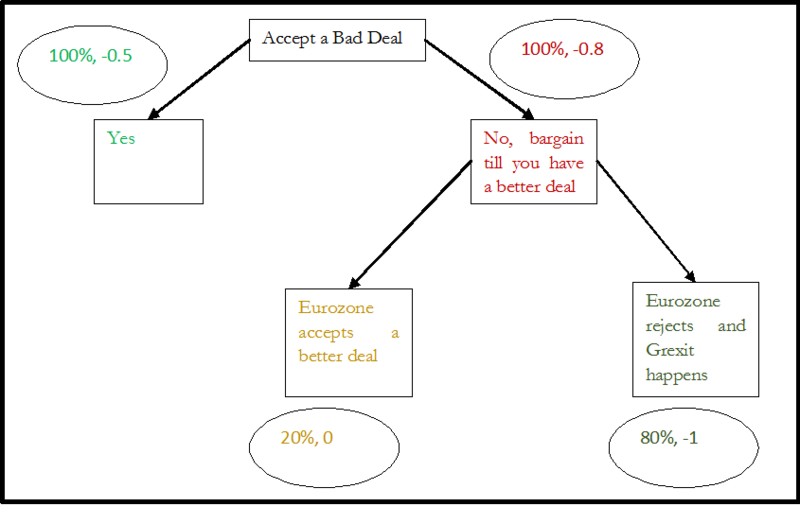 Without going into detailed decision tree, one can say that for the Eurozone finance ministers, withdrawing the deal would have reduced their probability of later getting blackmailed into a more favourable deal for Greece. It would have also put more pressure on Tsipras. Hence, withdrawing the deal was a sort of no-brainer for them. Greece duly voted against the referendum by an overwhelming margin on July 05th. But in a major blow to the Greece Government, the bond yields of the other vulnerable Eurozone countries did not react sharply. Greece, on the other hand, was going through tremendous economic tumult. It saw large spike in bond yields. It had to impose capital controls and close its banks. Banks were so liquidity strapped that they looked likely to collapse within a week, if not earlier. Tsipras’ hands were tied. Even though he had correctly predicted the result of the referendum, he had badly under-estimated its impact on the Greece economy and over-estimated its impact on the other eurozone markets. He thus lost his only major bargaining chip. The potential cost of Grexit was proving to be too severe on him and too mild for his liking to the rest of the Eurozone. He was now faced with a stark choice. Tspiras now did the rational thing – he accepted the bailout package on a harsher term. He also probably correctly predicted that if he did not accept the package and instead drove a hard bargain on the deal, the creditor countries were most likely to reject the same. For the drama in the interim period had increased the distrust of the Greek Government across the rest of Europe (thus increasing the cost of a milder bailout package to the governments of the creditor nations, who still have to answer to their constituents) and showed that the eurozone could probably withstand a Grexit (thus reducing the cost of a Grexit). In other words, the best possible outcome for both the parties in the negotiation is when the other party yields but it does not. If both the parties agree to compromises, they settle for utilities which are less than the former case, but also manage to avoid the worst possible outcome. If none of the parties agree to a compromise, they walk off the negotiating table and it ensures the worst possible outcomes for both the parties. Before the announcement of the first deal on Jul 27th, the pay-off table to the two parties looked something like this. In each parenthesis, the first number denotes the utility of Greece and the second number denoted the utility of the Eurozone countries. Like a game of chicken, the game had two possible Nash equilibria. Both the parties wanted a more favourable deal out of each other. A no-deal scenario would have resulted in Grexit which would have been the least desirable outcome for both the parties. However, the ensuing drama of the next two weeks significantly increased the cost of compromise for the creditor countries. The situation was so bad that reportedly some of the Eurozone finance ministers were thinking of the possibility of allowing a temporary Grexit. Similarly, the fact that the markets did not react violently to the referendum results reduced the cost of Grexit for them. Thus, by the time negotiations started again, the outcome of Grexit and swallowing a watered down deal would have probably had the same utility for them.For Greece though, the economic cost was unbearable and a Grexit would have significantly exacerbated it. 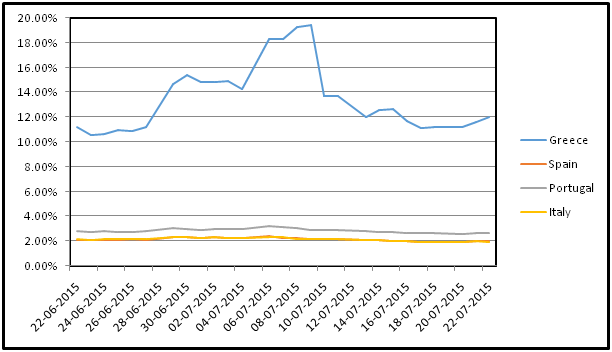 Thus, on 11th July, the pay-off table of the two parties in the various scenarios looked like this. The pay-offs thus might have shifted considerably. 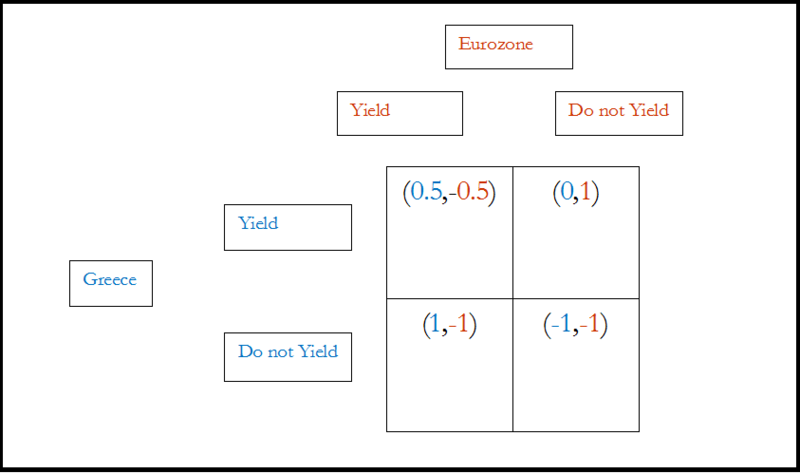 According to this diagram, if Greece did not yield, the Eurozone leaders did not lose out anything from not yielding. Thus, if Greece did not arrive at a compromise, the Eurozone countries were as likely to walk out of the negotiations as accepting a compromise. Both were equally bad choices for them. On the other hand, in case Greece yielded, the better outcome for the creditor nations would have been not to yield. Thus in one scenario, they were agnostic between the two choices whereas in the other case, they gained more by not yielding. Hence, their best interest lay in not yielding. Tsipras knew this. He knew that the Eurozone countries would not gain anything out of yielding. It had become as politically unpalatable as a Grexit. So given that they would not yield, Tsipras’ utility would have been maximized by yielding i.e. in accepting a bad deal forced down his throat. Of course, the whole scenario is constructed with the benefit of hindsight and has gross over-simplifications. But the basic conclusion remains intact. Tsipras took a huge risk, betting that a combination of the Greek voters rejecting the deal and markets reacting badly to that would force the Eurozone countries to panic against a Grexit and respect the democratic wishes of the Greek people by accepting a more sweetened deal. But instead, this manoeuvre made him extremely unpopular with his negotiators, dissolved their trust in him, grounded the Greece economy and showed no evidence of significantly damaging the rest of the Eurozone economy. Suitably chastened and having lost his bargaining power, he had to make a binary choice – between accepting a bad deal and see Greece exiting the Euro. He swallowed the bitter pill and chose the lesser of the two evils.